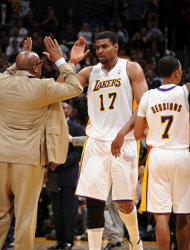 Andrew Bynum had 23 points and 16 rebounds, Pau Gasol made back-to-back 3-pointers in overtime, and the Los Angeles Lakers won their fourth straight game without Kobe Bryant, 112-108 over the Dallas Mavericks on Sunday. Ramon Sessions scored 22 points, and Gasol had 20 points and 10 rebounds for the Lakers, who are 4-1 while the NBA's leading scorer rests his bruised shin. Metta World Peace had 18 points as Los Angeles rallied from a fourth-quarter deficit before finishing off a four-game season sweep of the defending champion Mavericks, who swept the Lakers out of last season's playoffs. Dirk Nowitzki had 24 points on 9-of-28 shooting and 14 rebounds, but Jason Terry missed a potential tying layup at the rim with 5 seconds left in overtime for the Mavericks, whose three-game winning streak ended. Delonte West scored 20 points, and Terry had 21 before missing a shot while trying to avoid Matt Barnes' defense. Gasol added two free throws with 0.5 seconds left in the Lakers' fifth straight regular-season win over Dallas.